Sometimes you just want something easy for dinner. It doesn't mean it has to be packed full of calories. And, of course, every meal can be tasty and visually appealing. 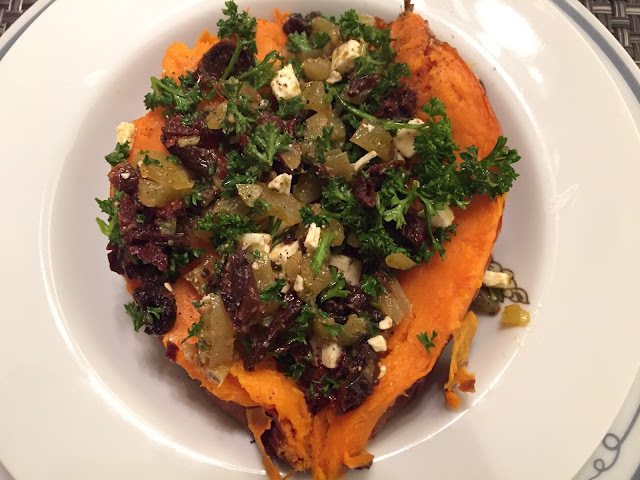 One of my easy go-to-dinners is a stuffed sweet potato. Why a sweet potato? Sweet potatoes have an amazing amount of health benefits including being an excellent source of vitamin A (beta-carotene). They are also a very good source of vitamin C, manganese, copper, pantothenic acid, and vitamin B6. Additionally, they are a good source of potassium, dietary fiber, niacin, vitamin B1, vitamin B2, and phosphorus. This recipe combines the sweet of the sweet potato with the savory of the feta and sun-dreid tomatoes. This makes the meal more satisfying and filling. You will feel sated and full at the end of this simple vegetarian meal. Wash and clean potatoes. Wrap them in foil and place them in a preheated oven at 350 degrees. Make sure to put a cookie sheet lined with foil on the rack below your potatoes to catch any of their drippings. Bake around an hour, until they give when you squeeze them in the middle. While the potatoes are baking mix together all remaining ingredients in a small bowl. When potatoes are done remove them from the oven and take them out of the foil. Place them each on a plate. Cut the potato lengthwise then fill each potato with half of the mixture and serve. Serves 2. Serving size 1 stuffed sweet potato. Calories: 242.